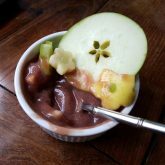 Til one day I wanted to make somethin’ new and interesting with my Amara Apple-Maqui Berry Baby Food. That’s when I discovered this weird thing. So Apple Shrub is a cocktail, guys. It inspired this non-alcoholic fruit dip recipe. See I’m using ingredients for not-their-usual-things lately. (In case y’haven’t noticed. ) Enjoying some food adventures. Spoon into one medium-large ramekin or two small ramekins and chill in fridge for a half hour. If desired, garnish with apples cut into flowers then brushed with lemon juice. Enjoy as a dip for sliced apples or pears.